The federal New Democratic Party’s financial health deteriorated last year, with the party’s balance sheet showing it finished 2017 deeper in the red than it has been for at least 16 years. The annual financial return, filed with Elections Canada, shows the party finished the year with assets worth $6.2 million and with liabilities totalling $9.3 million, leaving the party with negative net assets of $3.1 million. That’s the deepest hole the party has found itself in during any fiscal year since prior to 2001 — the earliest year for which records are available on the Elections Canada website. The party finished 2016 with negative net assets of $1.7 million. The NDP also saw more money going out than coming in over 2017, with revenues of $5.9 million set against expenses of $7.2 million. The total operating deficit for the year was $1.4 million. That was, however, half the size of the operating deficit in 2016. Filings from the other parties were posted earlier in the summer, but the NDP had asked for and received an extension from Elections Canada. A party spokesperson told CBC News that the financial return doesn’t necessarily reflect the current market value of the NDP’s real estate assets. “The report does not take into account the increased value of the Jack Layton Building [the NDP’s headquarters in downtown Ottawa], which brings our actual net assets balance in the positive,” said NDP spokesperson Guillaume Francoeur. 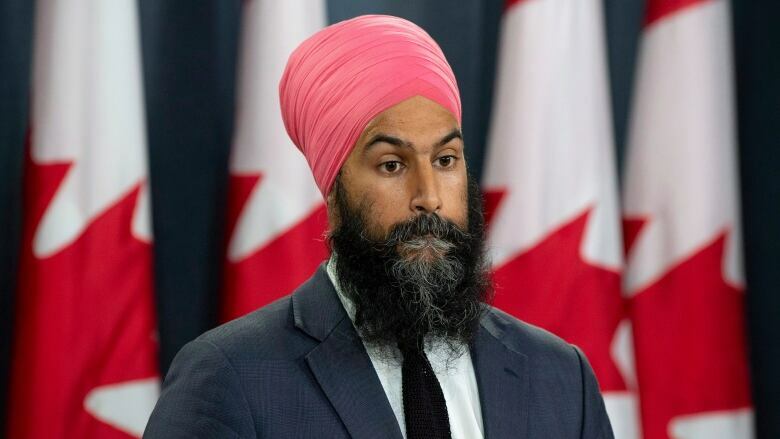 Jagmeet Singh became leader of the NDP in October, so he was at the party’s helm for only the last three months of 2017. Filings showing the financial health of the NDP in the current fiscal year will only be posted next summer, a few weeks before the 2019 federal election campaign begins. The New Democrats saw their balance sheet worsen as the party drew from its bank account. The party ended 2016 with about $2.5 million in cash in the bank. By the end of 2017, that had dropped by $2.1 million to just $378,000. At the same time, the NDP dipped into its line of credit to the tune of $1.45 million. The party’s balance sheet has been in the red twice before since 2001. The NDP had $2.2 million in negative net assets in 2005. The only other year which saw the party wind up in the red was 2016. The filings indicate that the New Democrats have taken steps to reduce their expenses to make up for the shortfall in revenues. The party reduced its salaries and benefits by about 21 per cent, dropping them by $646,000 to $2.4 million. That’s the least the party has paid for staff since 2002, when $2.3 million was spent on “administration” (and that does not take into account inflation over the last 15 years). The party also decreased its travel and hospitality expenses by about 38 per cent to $628,000. Still, with revenues relatively stable since 2016, the party has not yet reduced its expenses enough to make up for its decreased revenues. From 2003 to 2015, the NDP had revenues of at least $9 million in every fiscal year. Its revenues amounted to less than $6 million in each of the last two fiscal years. The loss of the publicly-funded per-vote subsidy is still hurting the NDP. Stephen Harper’s Conservative government phased it out during its last term in office. Between 2004 and 2015, the allowance brought the NDP an average of $4.6 million every year. The NDP’s fundraising performance is similar to what it was before the party formed the Official Opposition in 2011, but the New Democrats have not yet reduced their expenditures enough to make up for the loss of both the per-vote subsidy and its status as a government-in-waiting. Compared to the other parties, the New Democrats are in rough shape. The Liberals and Conservatives finished 2017 with net assets of $1.7 and $1.5 million, respectively. They also ended the year with more money in the bank. The Conservatives had $4.8 million in cash at the end of the year, compared to $1.6 million for the Liberals and $1.3 million for the Greens. But on one score, the New Democrats are getting more bang for their buck. The Conservatives spent about $7.2 million on fundraising in 2017 and the Liberals about $2.7 million. This means the Conservatives had a rate of return of about $3 in donations for every $1 spent on fundraising. For the Liberals, the ratio was a little better — about $5 earned for every dollar spent. The New Democrats spent $1 for every $12 received in donations. But the NDP is trailing the other parties in fundraising by a significant degree. In the first half of 2018, the Conservatives raised $12.1 million and the Liberals $6.4 million. The NDP raised only $2.2 million in the first six months of the year.